Before we move on to some more literary highlights of the festival, we are proud to announce that renowned Elvis Presley artist James Marais will be joining us in Richmond. He will officially shake, rattle and roll BookBedonnerd VII to a close. Once again the William Humphreys Art Gallery from Kimberley will be holding reading sessions, as well as creativity workshops and some superb filums for the kids, all to be held at the Richmond Community Centre. Mark Borrie, owner of Matjieskuil & Hawksmoor Wines, will be showing a Filum “Farm Workers at Hawksmoor” which is about the families of the workers who have lived and worked on the farm literally for centuries. As a fitting way to close the day Mark will be hosting a wine tasting of his wines before, during and after the filum. MAP (Modern Art Projects) will be hosting several exhibits at their main gallery on Loop Street (opposite the town hall and village green) as well as the 33 Loop Street Gallery. They will be staging a variety of exhibitions and site specific installations by a host of South African artists working with the Book or Words or writing as the primary concept in their work. A map of Richmond will follow soon with all the relevant information – venues and times. Artists participating, include Willem Boshoff, Francois du Plessis, Pitika Ntuli, Maja Marx, Andrew Munnik, Seretsi Moletsane, and a “GREAT” intervention by Guy du Toit. Harrie Siertsema has really gone to town with some fantastic material, so take a stroll just down the street to see some wonderful works of art. On the literary side of things I can't wait to welcome Jonty Driver back to SA. Now here's a name from yesteryear. Jonty personifies all that makes BookBedonnerd special. A few months back he approached Ivan Vladislavic at an overseas conference and told him he would love to speak at Booktown Richmond. Out of all the literary festivals in the country, he chose us. What a privilege it will be to host a writer of his stature! Another book I am looking forward to hearing more about is Dominique Botha's Valsrivier. This is a book that has won many an award and has had literary critics waxing lyrical since its release. One of Booktown Richmond's old friends Clinton V du Plessis returns to Richmond with a new anthology Woorde Roes in Die Water. From the time Etienne van Heerden introduced me to Clinton at the Schreiner Festival, I have been 'Bedonnerd' about his poetry. One of the great voices in Afrikaans poetry! Another book I can't wait to hear more about is Dennis Walters’ Old Bridges of the Eastern Cape. Ever since I saw Bridges of Madison County I have often wondered when a South African would document the beautiful Good on you Dennis; a great, great book. Not only do we have vets telling their stories but we have a late addition to the programme; the result of a veterinary encounter (a fox terrier with a cut tongue…. ), in the person of art dealer Warren Siebrits who will be speaking of Karoo born and renowned artist, Walter Battiss. But what makes BoekBedonnerd such a special festival is the sheer depth of topics. We are all eternally grateful to all of the many writers at this festival and the general public support which we have, which makes Booktown Richmond so exceptional. There is something special and quite unique in every author’s book being presented at BookBedonnerd VII. 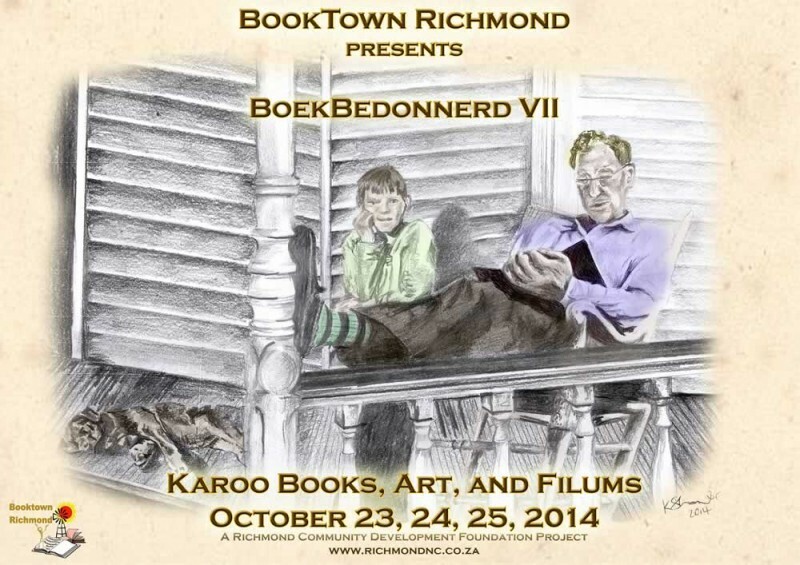 It is going to be a memorable literary and fun weekend and we are all very excited to welcome you to the dorp.